Scripture alone. The complete inspired Word of God, the Holy Bible is the only source for all doctrine taught in our congregation. "For by grace you are saved through faith; not by yourselves, for it is the gift of God: not by works that anyone should boast." Father the Creator, the Son, Jesus Christ, is our Savior, and the Holy Spirit brings us to faith and helps sustain our faith. The LAW shows us our sins and our need for a savior. Holy baptism and Holy Communion are sacred acts of worship instituted by God. Going to church is the will of God who created us and redeemed us from sin. "They that are of God, hear God's Words." We should fear and love God that we may not despise preaching of His Word, but gladly hear and learn it. St. Paul is reminding us that there is no salvation without faith and no faith without hearing God's Word. You are personally invited to come and learn with us the teachings of God's Word and worship with us at 10:30 a.m. each Sunday. afterall, we all need a Savior from our sins. Evangelical --God tells us to preach the Gospel, the Good News that Jesus Christ died for the sins of all and that salvation if free to all who believe. Liturgical--A common liturgy based upon scripture is used every Sunday to confess our sins and express our Christian beliefs through the Apostles' and Nicene Creeds. We listen to passages from the Bible every Sunday. We sing hymns of praise. We pray to the Triune God-- Father, Son, and Holy Spirit. 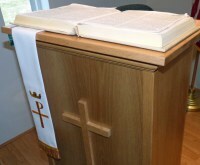 * Worship at a traditional, liturgical Lutheran Church. * Be a part of a small congregation. * Come listen and learn about God's Word.